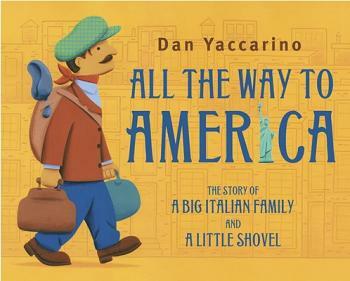 Dan Yaccarino’s great-grandfather arrived at Ellis Island with a small shovel and his parents’ good advice: “Work hard, but remember to enjoy life, and never forget your family.” With simple text and warm, colorful illustrations, Yaccarino recounts how the little shovel was passed down through four generations of this Italian-American family—along with the good advice. It’s a story that will have kids asking their parents and grandparents: Where did we come from? How did our family make the journey all the way to America? DAN YACCARINO is an internationally acclaimed author-illustrator with more than thirty books to his credit. Dan is also the creator of the animated TV series Oswald. He lives in New York City with his wife and two children. "In this affectionate personal history, Yaccarino (Lawn to Lawn) traces his ancestry from Sorrento, Italy to New York City. . . Folksy and warm, this is a timely reminder that America is a nation of immigrants." "Yaccarino’s family is proudly Italian, but their immigration story is universal. Readers of varied backgrounds will be able to identify with the search for a better life in a new country, the passing along of values and heirlooms, and the addition of new family members. The story will make an excellent family-history discussion starter." "With clarity and deep affection, Yaccarino turns his family history into a story of enduring charm. . . . A gloriously warm celebration."